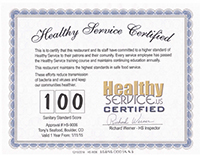 Healthy Service has very specific standards necessary for Healthy Service Certification. We understand that every restaurant is different and not all will be able to implement all of our standards. 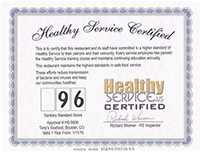 We applaud every effort to make service more sanitary and healthy. If a restaurant is able to maintain our minimum standards, they can become Healthy Service Certified and receive a score of 95. 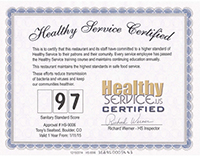 Each additional measure adds to your score. 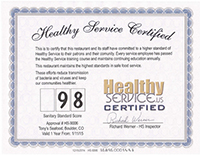 Perfect Healthy Service results in a score of 100. What would be your score and discount? Take the following test and find out! Click below.